Sources : Male Fern Rhizome is the dried rhizome and front bases of Dryopteris crassirhizoma Nakai. The drug is collected in autumn, pared off front and fibrous root, washed clean, dried in the sun. Action: To remove heat, counteract toxicity, and expel intestina worms. Rhizoma Dryopteris Crassirhizomae (carbonized): to arrest bleeding. Indications: Abdominal pain due to intestinal worm, sores. Rhizoma Dryopteris Crassirhizomae (Carbonized): Abnormal uterine bleeding. A fern is any one of a group of about 12,000 species of plants. Unlike mosses, they have xylem and phloem (making them vascular plants). They have stems, leaves, and roots like other vascular plants. Ferns do not have either seeds or flowers (they reproduce via spores). By far the largest group of ferns are the leptosporangiate ferns, but ferns as defined here (also called monilophytes) include horsetails, whisk ferns, marattioid ferns, and ophioglossoid ferns. The term pteridophyte also refers to ferns (and possibly other seedless vascular plants; see classification section below). Ferns first appear in the fossil record 360 million years ago in the Carboniferous but many of the current families and species did not appear until roughly 145 million years ago in the late Cretaceous (after flowering plants came to dominate many environments). Ferns are not of major economic importance, but some are grown or gathered for food, as ornamental plants, or for remediating contaminated soils. Some are significant weeds. They also feature in mythology, medicine, and art. Ferns are vascular plants differing from lycophytes by having true leaves (megaphylls). They differ from seed plants (gymnosperms and angiosperms) in their mode of reproduction—lacking flowers and seeds. Like all other vascular plants, they have a life cycle referred to as alternation of generations, characterized by a diploid sporophytic and a haploid gametophytic phase. Unlike the gymnosperms and angiosperms, the ferns’ gametophyte is a free-living organism. A sporophyte (diploid) phase produces haploid spores by meiosis. A spore grows by mitosis into a gametophyte, which typically consists of a photosynthetic prothallus. The gametophyte produces gametes (often both sperm and eggs on the same prothallus) by mitosis. A mobile, flagellate sperm fertilizes an egg that remains attached to the prothallus. The fertilized egg is now a diploid zygote and grows by mitosis into a sporophyte (the typical “fern” plant). The stereotypic image of ferns growing in moist shady woodland nooks is far from being a complete picture of the habitats where ferns can be found growing. Fern species live in a wide variety of habitats, from remote mountain elevations, to dry desert rock faces, to bodies of water or in open fields. Ferns in general may be thought of as largely being specialists in marginal habitats, often succeeding in places where various environmental factors limit the success of flowering plants. Some ferns are among the world’s most serious weed species, including the bracken fern growing in the British highlands, or the mosquito fern (Azolla) growing in tropical lakes, both species forming large aggressively spreading colonies. 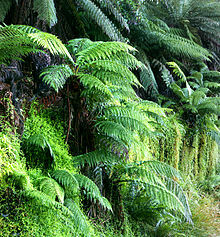 There are four particular types of habitats that ferns are found in: moist, shady forests; crevices in rock faces, especially when sheltered from the full sun; acid wetlands including bogs and swamps; and tropical trees, where many species are epiphytes (something like a quarter to a third of all fern species). Many ferns depend on associations with mycorrhizal fungi. Many ferns only grow within specific pH ranges; for instance, the climbing fern (Lygodium) of eastern North America will only grow in moist, intensely acid soils, while the bulblet bladder fern (Cystopteris bulbifera), with an overlapping range, is only found on limestone. The spores are rich in lipids, protein and calories and some vertebrates so eat these. The European woodmouse (Apodemus sylvaticus) has been found to eat the spores of Culcita macrocarpa and the bullfinch (Pyrrhula murina) and the short-tailed bat (Mystaina tuberculata) also eat fern spores. Stems: Most often an underground creeping rhizome, but sometimes an above-ground creeping stolon (e.g., Polypodiaceae), or an above-ground erect semi-woody trunk (e.g., Cyatheaceae) reaching up to 20 m in a few species (e.g., Cyathea brownii on Norfolk Island and Cyathea medullaris in New Zealand). Brophophyll: A leaf that produces abnormally large amounts of spores. Their leaves are also larger than the other leaves but bear a resemblance to trophophylls. Rhizoids: root-like structures (not true roots) that consist of single greatly elongated cells, water and mineral salts are absorbed over the whole structure. Rhizoids anchor the prothallus to the soil. One difference between sporophytes and gametophytes might be summed up by the saying that “Nothing eats ferns, but everything eats gametophytes.” This is an over-simplification, but it is true that gametophytes are often difficult to find in the field because they are far more likely to be food than are the sporophytes. Ferns first appear in the fossil record in the early-Carboniferous period. By the Triassic, the first evidence of ferns related to several modern families appeared. The “great fern radiation” occurred in the late-Cretaceous, when many modern families of ferns first appeared. One problem with fern classification is the problem of cryptic species. A cryptic species is a species that is morphologically similar to another species, but differs genetically in ways that prevent fertile interbreeding. A good example of this is the currently designated species Asplenium trichomanes, the maidenhair spleenwort. This is actually a species complex that includes distinct diploid and tetraploid races. There are minor but unclear morphological differences between the two groups, which prefer distinctly differing habitats. In many cases such as this, the species complexes have been separated into separate species, thus raising the number of overall fern species. Possibly many more cryptic species are yet to be discovered and designated. Ferns have traditionally been grouped in the Class Filices, but modern classifications assign them their own phylum or division in the plant kingdom, called Pteridophyta, also known as Filicophyta. The group is also referred to as Polypodiophyta, (or Polypodiopsida when treated as a subdivision of tracheophyta (vascular plants), although Polypodiopsida sometimes refers to only the leptosporangiate ferns). The term “pteridophyte” has traditionally been used to describe all seedless vascular plants, making it synonymous with “ferns and fern allies”. This can be confusing since members of the fern phylum Pteridophyta are also sometimes referred to as pteridophytes. The study of ferns and other pteridophytes is called pteridology, and one who studies ferns and other pteridophytes is called a pteridologist. Traditionally, three discrete groups of plants have been considered ferns: two groups of eusporangiate ferns—families Ophioglossaceae (adders-tongues, moonworts, and grape-ferns) and Marattiaceae—and the leptosporangiate ferns. The Marattiaceae are a primitive group of tropical ferns with a large, fleshy rhizome, and are now thought to be a sibling taxon to the main group of ferns, the leptosporangiate ferns. Several other groups of plants were considered “fern allies”: the clubmosses, spikemosses, and quillworts in the Lycopodiophyta, the whisk ferns in Psilotaceae, and the horsetails in the Equisetaceae. More recent genetic studies have shown that the Lycopodiophyta are more distantly related to other vascular plants, having radiated evolutionarily at the base of the vascular plant clade, while both the whisk ferns and horsetails are as much “true” ferns as are the Ophioglossoids and Marattiaceae. In fact, the whisk ferns and Ophioglossoids are demonstrably a clade, and the horsetails and Marattiaceae are arguably another clade. Molecular data—which remain poorly constrained for many parts of the plants’ phylogeny — have been supplemented by recent morphological observations supporting the inclusion of Equisetaceae within the ferns, notably relating to the construction of their sperm, and peculiarities of their roots (Smith et al. 2006, and references therein). However, there are still differences of opinion about the placement of the Equisetum species (see Equisetopsida for further discussion). The last group includes most plants familiarly known as ferns. Modern research supports older ideas based on morphology that the Osmundaceae diverged early in the evolutionary history of the leptosporangiate ferns; in certain ways this family is intermediate between the eusporangiate ferns and the leptosporangiate ferns. Ferns figure in folklore, for example in legends about mythical flowers or seeds. In Slavic folklore, ferns are believed to bloom once a year, during the Ivan Kupala night. Although alleged to be exceedingly difficult to find, anyone who sees a “fern flower” is thought to be guaranteed to be happy and rich for the rest of their life. Similarly, Finnish tradition holds that one who finds the “seed” of a fern in bloom on Midsummer night will, by possession of it, be guided and be able to travel invisibly to the locations where eternally blazing Will o’ the wisps called aarnivalkea mark the spot of hidden treasure. These spots are protected by a spell that prevents anyone but the fern-seed holder from ever knowing their locations. “Pteridomania”‘ is a term for the Victorian era craze of fern collecting and fern motifs in decorative art including pottery, glass, metals, textiles, wood, printed paper, and sculpture “appearing on everything from christening presents to gravestones and memorials.” The fashion for growing ferns indoors led to the development of the Wardian case, a glazed cabinet that would exclude air pollutants and maintain the necessary humidity. Barnsley fern created using chaos game, through an Iterated function system (IFS). The dried form of ferns was also used in other arts, being used as a stencil or directly inked for use in a design. The botanical work, The Ferns of Great Britain and Ireland, is a notable example of this type of nature printing. The process, patented by the artist and publisher Henry Bradbury, impressed a specimen on to a soft lead plate. The first publication to demonstrate this was Alois Auer’s The Discovery of the Nature Printing-Process. Ferns are sometimes used in medicine to treat cuts and clean them out. Ferns are also good bandages if you are stuck out in the wild. Rubbing a sword fern frond spore-side-down on a stinging nettle sting removes the stinging. “Asparagus fern”—This may apply to one of several species of the monocot genus Asparagus, which are flowering plants. “Sweetfern”—A flowering shrub of the genus Comptonia. “Air fern”—A group of animals called hydrozoan that are distantly related to jellyfish and corals. They are harvested, dried, dyed green, and then sold as a “plant” that can “live on air”. While it may look like a fern, it is merely the skeleton of this colonial animal. “Fern bush”—Chamaebatiaria millefolium—a rose family shrub with fern-like leaves. In addition, the book Where the Red Fern Grows has elicited many questions about the mythical “red fern” named in the book. There is no such known plant, although there has been speculation that the oblique grape-fern, Sceptridium dissectum, could be referred to here, because it is known to appear on disturbed sites and its fronds may redden over the winter.